" Pondok Labu area becomes our concern, as the vehicle volume there is very dense. 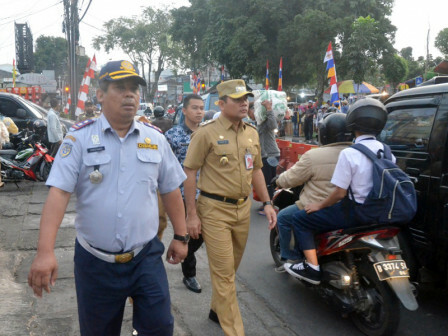 That's why we do engineering traffic trial today"
South Jakarta Administration conducts traffic-engineering trial around Jalan Pondok Labu, Pondok Labu, Cilandak in a bid to parse traffic jam. South Jakarta Vice Mayor, Arifin expressed that Pondok Labu area is one of the access points for vehicles from Cinere to Jakarta. No wonder, traffic jams often occur in the area. "Pondok Labu area becomes our concern, as the vehicle volume there is very dense. That's why we do engineering traffic trial today," he stated, Tuesday (8/7). During trial, vehicle coming from Fatmawati towards Pondok Labu and Cinere a re rerouted to turn left through Jalan Pinang, Jalan Jalan Pinang 1, turn right to Jalan Margasatwa Raya. Afterwards, they must turn left to Cinere. By so, it is hoped able to parse traffic jam well. Because there are no more vehicle meetings from Fatmawati and Jalan Margasatwa Raya in Pondok Labu Market’s Traffic Light. "We do this to parse traffic jam and smoothen traffic flow in the field," he exclaimed. According to him, traffic-engineering trial itself will be applied two weeks for 24 hours and will be continued with evaluation. "We also intend to prepare personnel to direct the driver," he expressed. Meanwhile, South Jakarta Transportation Sub-dept. Head, Christianto added his side plans to cooperate with Pondok Labu Urban Village to hold socialization. "We'll see in a week what are the shortcomings that we have to correct," he stated.